I made a lamp! I’m no longer a one hit lamp wonder. 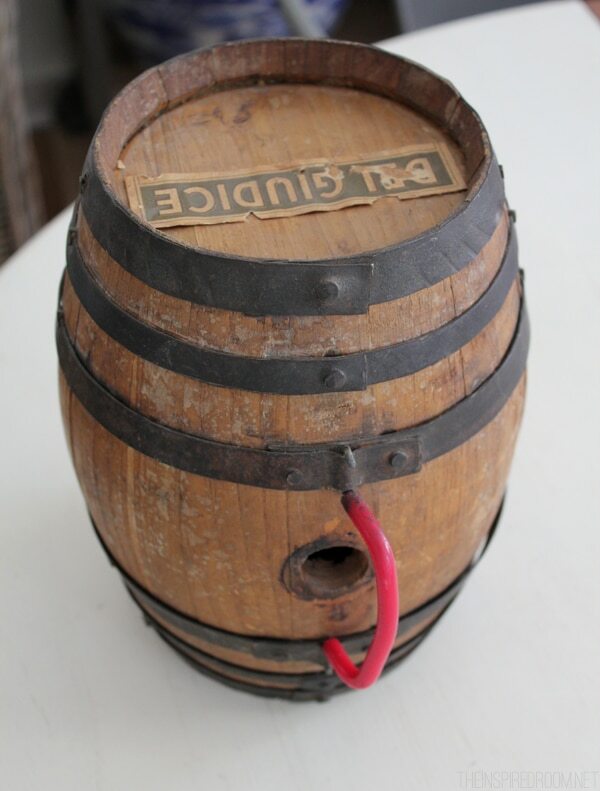 I found this small fun vintage wine barrel at a flea market for $14. 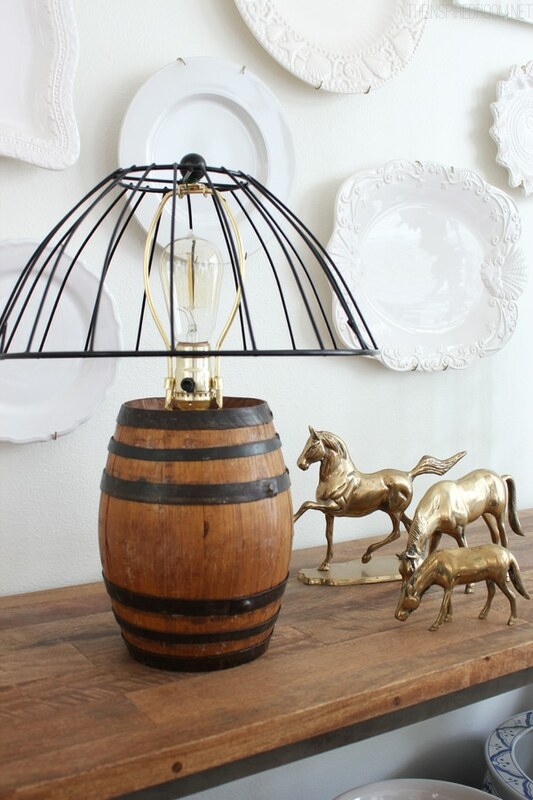 Armed with the challenge to make a lamp inspired by this DIY reclaimed wood lamp, I knew that this wine barrel would be perfect for the job! Lamp socket and cord (mine is a clear cord). 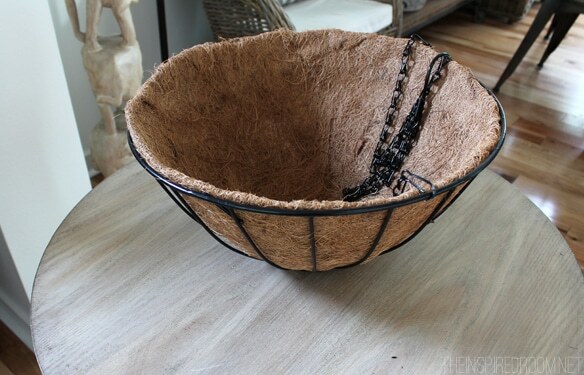 Wire hanging plant basket (14 inch diameter). It was so easy. I just drilled a hole in the top of the barrel and pulled the wires up through the convenient existing hole in the back. Then using the instructions on the lamp socket packaging, my husband wired the lamp socket. I’m sure there is a more professional way to secure the socket to the barrel, but because I’m me, I used super glue. So far so good. For a DIY wire lampshade I found this hanging wire plant basket at The Home Depot. We just took the insert out and chains off and turned it upside down! Easy peasy. I had a little black finial to top it off. To secure the shade a little more, I just wrapped some wire around the cage and harp. 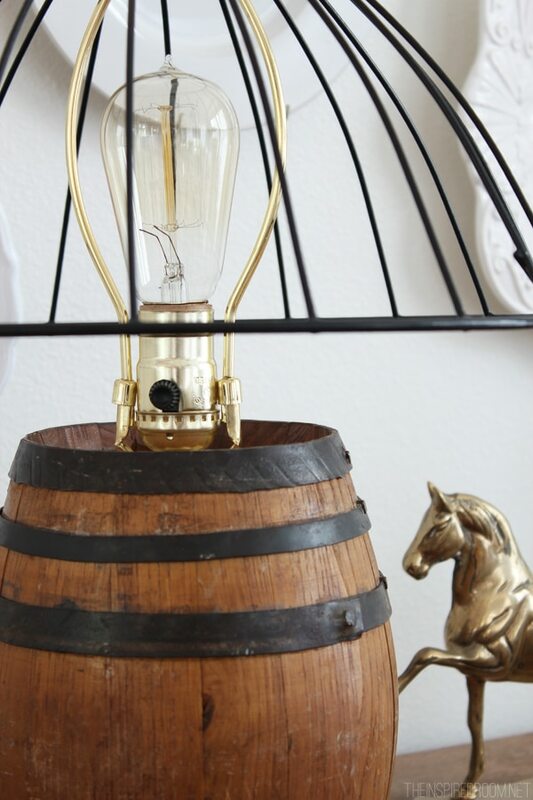 As a finishing touch, I added an Edison light bulb which looks pretty cool with the cage shade. The glow from the Edison bulb looks beautiful at night. I think it turned out so cute, don’t you? 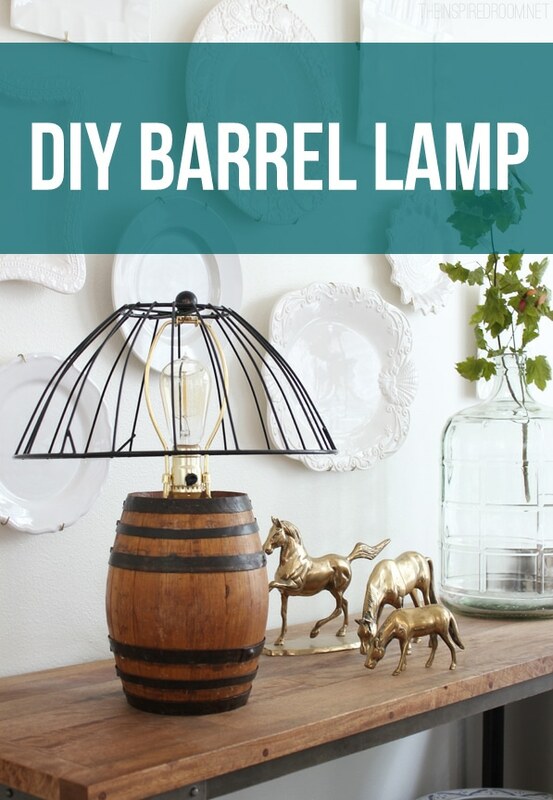 I’ll be bringing the lamp to the Home Depot for the Lamps & Lighting DIY Workshop on July 12 from 10:00-11:30AM at The Home Depot store in Bellevue, WA! If you are Seattle local, you can come see it in person :-). 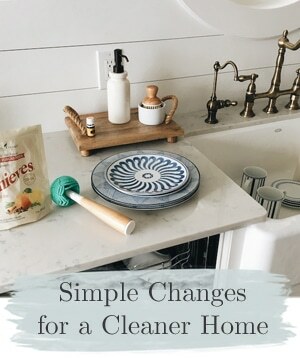 The Home Depot offers free workshops for do-it-yourselfers of all ages and experience levels who want to learn how to take on more home projects. 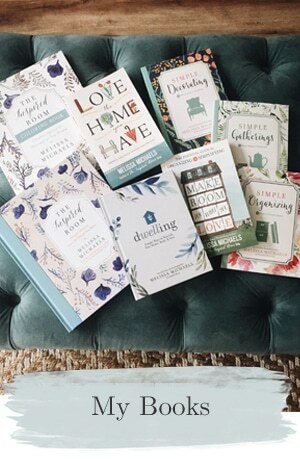 If you want to sign up for a workshop, you can find one near you and sign up via this link to the DIY Workshops registration page. 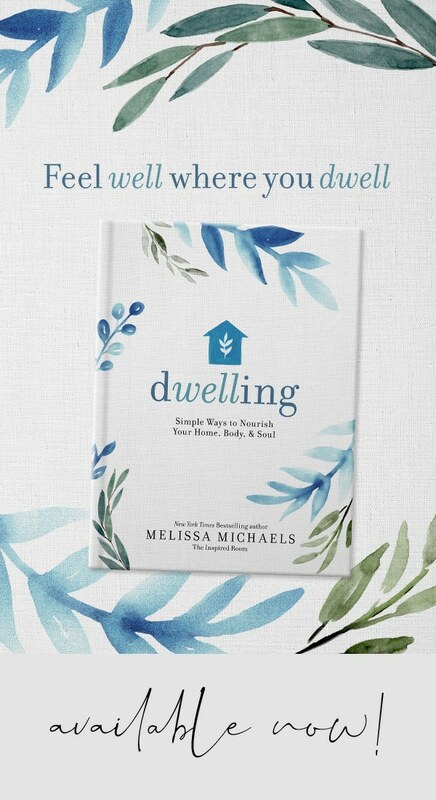 Use the hashtag #DIYWorkshop to follow along on social media! See my DIY Bottle Lamp here! Very nice. Have you considered spray painting the brass part black? 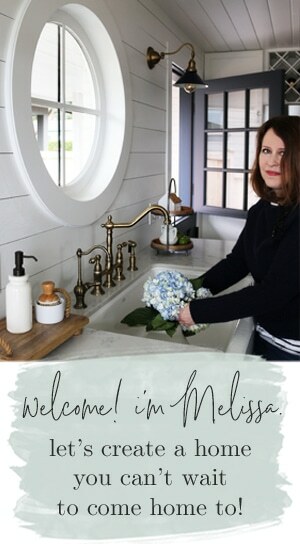 My oh my, Melissa, you are becoming quite the DIYer! Great re-purpose project! I know, I hardly recognize myself making my own lamps! Ha! At the first picture I was wondering where you found a lampshade with that much ribbing, I guessed you just removed old fabric! HA! I was wrong! You did a great job here! 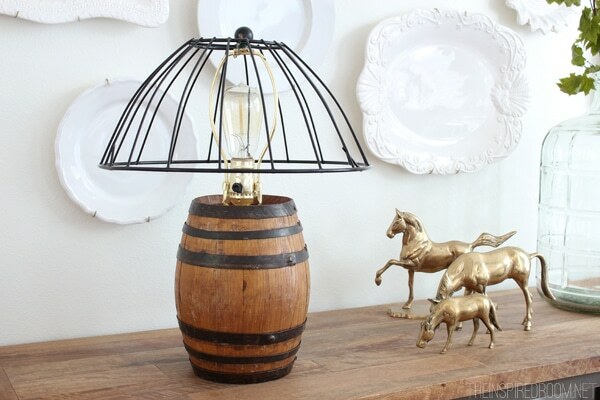 I see so many things I think would make great lamps, I just need to get over my fear of power tools! Yes, a drill isn’t too bad! If I can do it, you can. TRUST ME. Heheh! 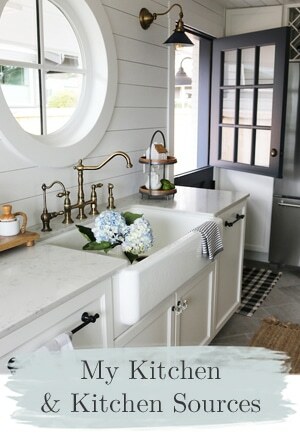 This is way cute and the Edison bulb is a great finishing touch. Love the little wine barrel. Nebrr have seen one in SC but I would love to find one. Terrific idea. What a great lamp so clever and doesn’t everyone use super glue for projects LOL. Great Job. Have a great day. Great lamp. 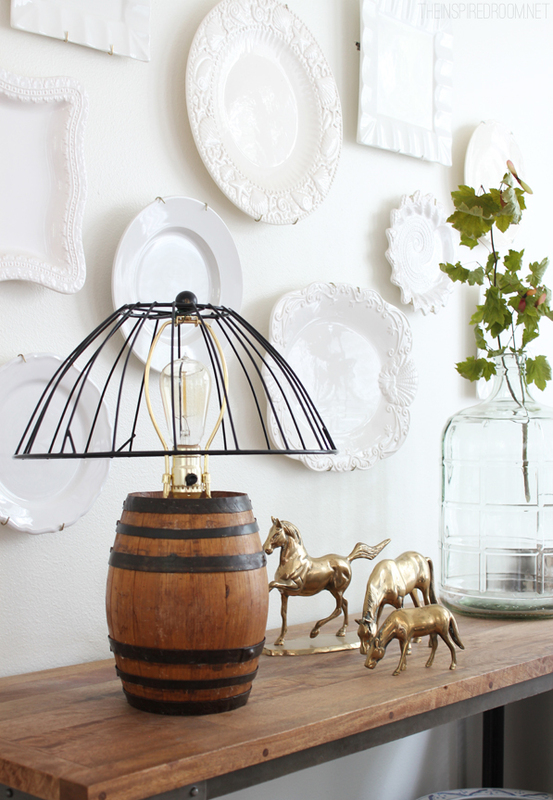 Perfect in keeping with the rustic appeal and with a few horses nearby it is charming! Love that lamp shade. I am a huge fan of yours. Haha! This is genius! And the plate wall is gorgeous! Very creative! 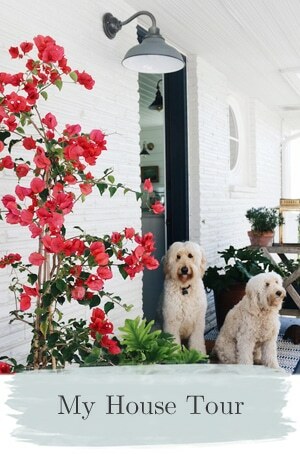 pinning for inspiration. So charming! I am now on the look out for a wine barrel. I also equally love the inventive “shade.” So unique. I still have your jar lamp pinned (I’m hoping to do that project soon) and then you go and do another awesome lamp. 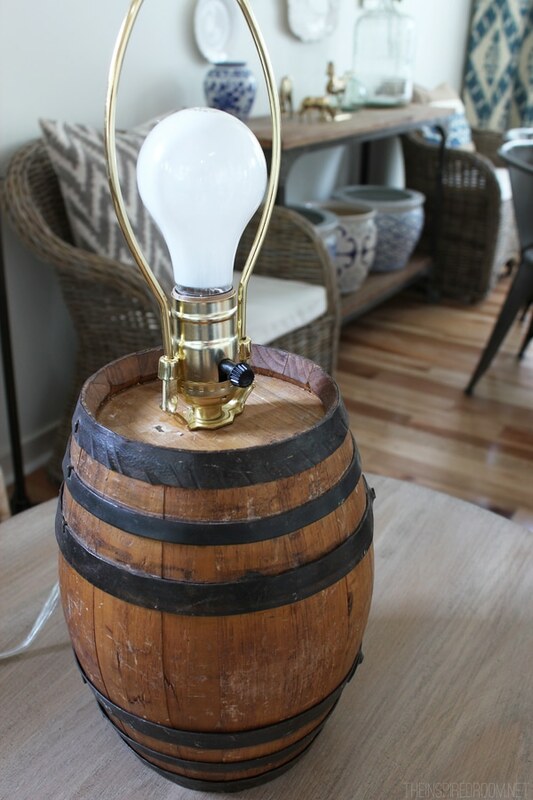 I’m thinking hard now for places I could put a barrel lamp..Thank you for the continued inspiration! How clever are you! That looks so charming. Great piece.. Only thing I would have done differently would have been to Bronze or “age” the shiney brass. 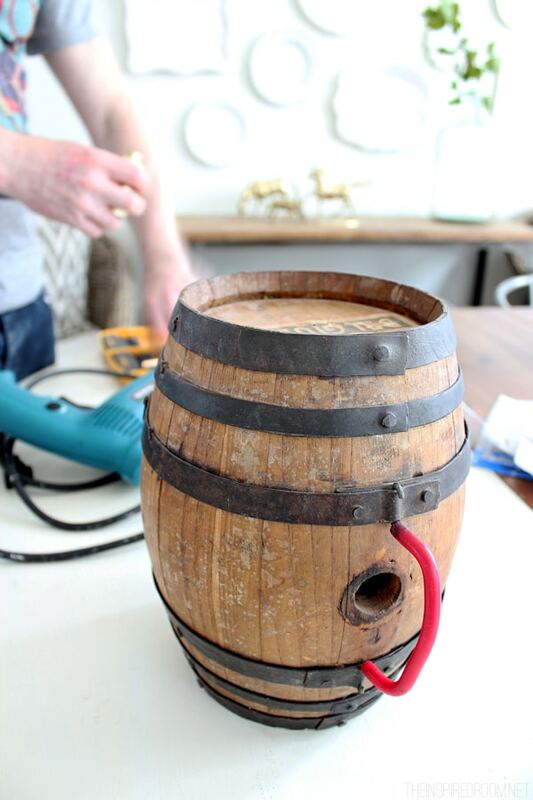 Barrel is rustic. Re-invented shade has a rustic feel and the electrical side has a “fresh from the Home Depot” look. Other than that, Great piece.